Product #15582 | SKU DTP Beat Kit Pro 7 | 0.0 (no ratings yet) Thanks for your rating! The DTP Beat Kit Pro 7 is an elite full-spectrum drum set designed for an ever growing number of professional drummers and sound engineers looking for a high-performance all-rounder kit that allows for reproducing authentic, powerful sound full of detail in any setting. From upscale studio projects to big live acts, the DTP Beat Kit Pro 7 provides just the kind of reliable premium gear you need for a memorable performance. 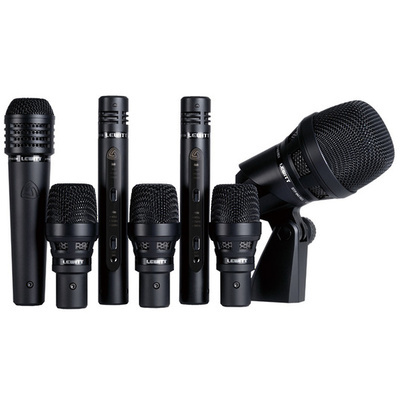 This 7-piece pro-kit contains our drum mic masterpiece, the dual-element cardioid DTP 640 REX, three dynamic DTP 340 TT mics, two LCT 340 condenser mics and one cardioid dynamic MTP 440 DM mic, as well as a selection of shock and drum mounts. All these pro-quality, precision-engineered microphones feature a tailored frequency response designed specifically for miking drums, percussions and bass instruments. The complete package exhibits fantastic SPL handling and off-axis sound rejection, delivering remarkably bright, smooth and balanced sound-anytime, anywhere.